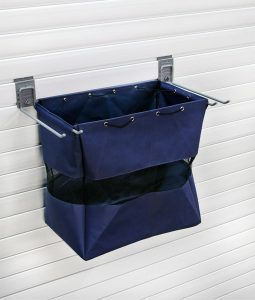 The StoreWALL Medium Tote Bag (Grab & Go Bag) is designed to help store items for quick access. These bags are designed with heavy duty tear-resistant canvas and mesh panels, which allow for visibility and circulation. Perfect for athletic items such as balls, shoes and padding. The hook used to hang the Medium Tote Bag are the 300mm Universal Hook. You require 2 of these. They are sold separately. Our Medium Tote Bag is not just another bag. Keep everything you need for your kids sports training kit and when you are ready to GO, slip the Garage Bag off the Universal Hook and off you go. Simple, clean and easy. The StoreWALL range of Tote Bags also includes the Small and Large sized bags. The Medium Tote Bag can hold up to 13KGs of weight. Do not over pack the bag to prevent the seams from stretching or tearing.